A ship ( Audio (US) (help·info)) is a large vessel that floats on water. Ships are generally distinguished from boats based on size and cargo or passenger capacity. In traditional terms, ships were considered to be vessels which had at least one continuous water-tight deck extending from bow to stern. However, some modern designs for ships, and boats, have made that particular definition less accurate. Ships may be found on lakes, seas, and rivers and they allow for a variety of activities, such as the transport of people or goods, fishing, entertainment, public safety, and warfare. These vessels were also key in history's great explorations and scientific and technological development. Navigators such as Zheng He spread such inventions as the compass and gunpowder. Ships have been used for such purposes as colonization and the slave trade, and have served scientific, cultural, and humanitarian needs. New crops that had come from the Americas via the European seafarers in the 16th century significantly contributed to the world's population growth. As Thor Heyerdahl demonstrated with his tiny craft the Kon-Tiki, it is possible to navigate long distances upon a simple log raft. From Mesolithic canoes to today's powerful nuclear-powered aircraft carriers, ships tell the history of human technological development. Ships can usually be distinguished from boats based on size and the ship's ability to operate independently for extended periods. A commonly used rule of thumb is that if one vessel can carry another, the larger of the two is a ship. As dinghies are common on sailing yachts as small as 35 feet (10.67 m), this rule of thumb is not foolproof. In a more technical and now rare sense, the term ship refers to a sailing ship with at least 3 square-rigged masts and a full bowsprit, with lesser ships described by their sailplan (e.g., barque, brigantine, etc.). A number of large vessels are traditionally referred to as boats. Submarines are a prime example. Other types of large vessels which are traditionally called boats are the Great Lakes freighter, the riverboat, and the ferryboat. Though large enough to carry their own boats and heavy cargoes, these vessels are designed for operation on inland or protected coastal waters. The history of boats parallels the human adventure. The first known boats date back to the Neolithic Period, about 10,000 years ago. These early vessels had limited function: they could move on water, but that was it. They were used mainly for hunting and fishing. The oldest dugout canoes found by archaeologists were often cut from coniferous tree logs, using simple stone tools. By around 3000 BC, Ancient Egyptians already knew how to assemble wooden planks into a ship hull. They used woven straps to lash the planks together, and reeds or grass stuffed between the planks helped to seal the seams. The Greek historian and geographer Agatharchides had documented ship-faring among the early Egyptians: "During the prosperous period of the Old Kingdom, between the 30th and 25th centuries B. C., the river-routes were kept in order, and Egyptian ships sailed the Red Sea as far as the myrrh-country." Sneferu's ancient cedar wood ship Praise of the Two Lands is the first reference recorded (2613 BCE) to a ship being referred to by name. In East Asia, by the time of the Zhou Dynasty ship technologies such as stern mounted rudders were developed, and by the Han Dynasty, a well kept naval fleet was an integral part of the military. Ship technology advanced to the point where by the medieval period, water tight compartments were developed. During the 15th century in the Ming Dynasty, one of the largest and most powerful naval fleet in the world was assembled for the diplomatic and power projection voyages of Zheng He. Elsewhere in Korea in the 15th century, one of the world's first iron-clads, the turtle ship, was also developed. By about 2000 BC, Minoan civilization in Crete had evolved into a naval power exercising effective control of the sea in the eastern Mediterranean. It is known that ancient Nubia/Axum traded with India, and there is evidence that ships from Northeast Africa may have sailed back and forth between India/Sri Lanka and Nubia trading goods and even to Persia, Himyar and Rome. Aksum was known by the Greeks for having seaports for ships from Greece and Yemen. Elsewhere in Northeast Africa, the Periplus of the Red Sea reports that Somalis, through their northern ports such as Zeila and Berbera, were trading frankincense and other items with the inhabitants of the Arabian Peninsula well before the arrival of Islam as well as with then Roman-controlled Egypt. The Swahili people had various extensive trading ports dotting the cost of medieval East Africa and Great Zimbabwe had extensive trading contacts with Central Africa, and likely also imported goods brought to Africa through the Southeast African shore trade of Kilwa in modern-day Tanzania. At about the same time, people living near Kongens Lyngby in Denmark invented the segregated hull, which allowed the size of boats to gradually be increased. Boats soon developed into keel boats similar to today's wooden pleasure craft. The first navigators began to use animal skins or woven fabrics as sails. Affixed to the top of a pole set upright in a boat, these sails gave early ships range. This allowed men to explore widely, allowing, for example the settlement of Oceania about 3,000 years ago. The Phoenicians and Greeks gradually mastered navigation at sea aboard triremes, exploring and colonizing the Mediterranean via ship. Around 340 BC, the Greek navigator Pytheas of Massalia ventured from Greece to Western Europe and Great Britain. In the course of the 2nd century BC, Rome went on to destroy Carthage and subdue the Hellenistic kingdoms of the eastern Mediterranean, achieving complete mastery of the inland sea, that they called Mare Nostrum. The monsoon wind system of the Indian Ocean was first sailed by Greek navigator Eudoxus of Cyzicus in 118 BC. With 300 Greek ships a year sailing between Roman Empire and India, the annual trade may have reached 300,000 tons. The Battle of Lepanto, 1571, naval engagement between allied Christian forces and the Ottoman Turks. Towards the end of the fourteenth century, ships like the carrack began to develop towers on the bow and stern. These towers decreased the vessel's stability, and in the fifteenth century, the caravel, a descendent of the Arabic qarib which could sail closer to the wind, became more widely used. The towers were gradually replaced by the forecastle and sterncastle, as in the carrack Santa María of Christopher Columbus. This increased freeboard allowed another innovation: the freeing port, and the artillery associated with it. During the Age of the Ajuuraan, the Somali sultanates and republics of Merca, Mogadishu, Barawa, Hobyo and their respective ports flourished, enjoying a lucrative foreign commerce with ships sailing to and coming from Arabia, India, Venetia, Persia, Egypt, Portugal and as far away as China. In the 1500s, Duarte Barbosa noted that many ships from the Kingdom of Cambaya in what is modern-day India sailed to Mogadishu with cloth and spices, for which they in return received gold, wax and ivory. Barbosa also highlighted the abundance of meat, wheat, barley, horses, and fruit on the coastal markets, which generated enormous wealth for the merchants. Middle Age Swahili Kingdoms are known to have had trade port islands and trade routes with the Islamic world and Asia and were described by Greek historians as "metropolises". Famous African trade ports such as Mombasa, Zanzibar, and Kilwa were known to Chinese sailors such as Zheng He and medieval Islamic historians such as the Berber Islamic voyager Abu Abdullah ibn Battua. In the 14th century CE King Abubakari I, the brother of King Mansa Musa of the Mali Empire is thought to have had a great armada of ships sitting on the coast of West Africa. This is corroborated by ibn Battuta himself who recalls several hundred Malian ships off the coast. This has led to great speculation, with historical evidence, that it is possible that Malian sailors may have reached the coast of Pre-Columbian America under the rule of Abubakari II, nearly two hundred years before Christopher Columbus and that black traders may have been in the Americas before Columbus. 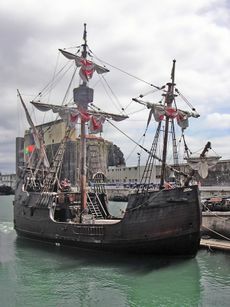 The carrack and then the caravel were developed in Iberia. After Columbus, European exploration rapidly accelerated, and many new trade routes were established. In 1498, by reaching India, Vasco da Gama proved that the access to the Indian Ocean from the Atlantic was possible. These explorations in the Atlantic and Indian Oceans were soon followed by France, England and the Netherlands, who explored the Portuguese and Spanish trade routes into the Pacific Ocean, reaching Australia in 1606 and New Zealand in 1642. A major sea power, the Dutch in 1650 owned 16,000 merchant ships. In the 17th century Dutch explorers such as Abel Tasman explored the coasts of Australia, while in the 18th century it was British explorer James Cook who mapped much of Polynesia. During the first half of the eighteenth century, the French Navy began to develop a new type of vessel known as a ship of the line, featuring seventy-four guns. This type of ship became the backbone of all European fighting fleets. These ships were 56 metres (184 ft) long and their construction required 2,800 oak trees and 40 kilometres (25 mi) of rope; they carried a crew of about 800 sailors and soldiers. During the 19th century the Royal Navy enforced a ban on the slave trade, acted to suppress piracy, and continued to map the world. A clipper was a very fast sailing ship of the 19th century. The clipper route fell into commercial disuse with the introduction of steam ships, and the opening of the Suez and Panama Canals. Ships are difficult to classify, mainly because there are so many criteria to base classification on. One classification is based on propulsion; with ships categorised as either a sailing ship a Steamship or a motorship. Sailing ships are ships which are propelled solely by means of sails. Steamships are ships which are propelled by steam engines. Motorships are ships which use internal combustion engines as a means to propel themselves. Motorships include ships that propel itself through the use of both sail and mechanical means. The building materials used, giving steel, aluminum, wood, fiberglass, and plastic. Commercial vessels or merchant ships can be divided into three broad categories: cargo ships, passenger ships, and special-purpose ships. Cargo ships transport dry and liquid cargo. Dry cargo can be transported in bulk by bulk carriers, packed directly onto a general cargo ship in break-bulk, packed in intermodal containers as aboard a container ship, or driven aboard as in roll-on roll-off ships. Liquid cargo is generally carried in bulk aboard tankers, such as oil tankers, chemical tankers and LNG tankers, although smaller shipments may be carried on container ships in tank containers. Passenger ships range in size from small river ferries to giant cruise ships. This type of vessel includes ferries, which move passengers and vehicles on short trips; ocean liners, which carry passengers on one-way trips; and cruise ships, which typically transport passengers on round-trip voyages promoting leisure activities aboard and in the ports they visit. Most commercial vessels have full hull-forms to maximize cargo capacity. Hulls are usually made of steel, although aluminum can be used on faster craft, and fiberglass on the smallest service vessels. Commercial vessels generally have a crew headed by a captain, with deck officers and marine engineers on larger vessels. Special-purpose vessels often have specialized crew if necessary, for example scientists aboard research vessels. Commercial vessels are typically powered by a single propeller driven by a diesel engine. Vessels which operate at the higher end of the speed spectrum may use pump-jet engines or sometimes gas turbine engines. Modern warships are generally divided into seven main categories, which are: aircraft carriers, cruisers, destroyers, frigates, corvettes, submarines and amphibious assault ships. Battleships encompass an eighth category, but are not in current service with any navy in the world. Most military submarines are either attack submarines or ballistic missile submarines. Until the end of World War II , the primary role of the diesel/electric submarine was anti-ship warfare, inserting and removing covert agents and military forces, and intelligence-gathering. With the development of the homing torpedo, better sonar systems, and nuclear propulsion, submarines also became able to effectively hunt each other. The development of submarine-launched nuclear missiles and submarine-launched cruise missiles gave submarines a substantial and long-ranged ability to attack both land and sea targets with a variety of weapons ranging from cluster bombs to nuclear weapons. Most navies also include many types of support and auxiliary vessels, such as minesweepers, patrol boats, offshore patrol vessels, replenishment ships, and hospital ships which are designated medical treatment facilities. Combat vessels like cruisers and destroyers usually have fine hulls to maximize speed and maneuverability. They also usually have advanced electronics and communication systems, as well as weapons. Fishing boats are generally small, often little more than 30 meters (98 ft) but up to 100 metres (330 ft) for a large tuna or whaling ship. Aboard a fish processing vessel, the catch can be made ready for market and sold more quickly once the ship makes port. Special purpose vessels have special gear. For example, trawlers have winches and arms, stern-trawlers have a rear ramp, and tuna seiners have skiffs. In 2004, 85,800,000 tonnes (84,400,000 LT; 94,600,000 ST) of fish were caught in the marine capture fishery. Anchoveta represented the largest single catch at 10,700,000 tonnes (10,500,000 LT; 11,800,000 ST). That year, the top ten marine capture species also included Alaska pollock, Blue whiting, Skipjack tuna, Atlantic herring, Chub mackerel, Japanese anchovy, Chilean jack mackerel, Largehead hairtail, and Yellowfin tuna. Other species including salmon, shrimp, lobster, clams, squid and crab, are also commercially fished. The St. Mary's Challenger, built in 1906 as the William P Snyder, is the oldest laker still working on the Lakes. Similarly, the E.M. Ford, built in 1898 as the Presque Isle, was sailing the lakes 98 years later in 1996. As of 2007 the Ford was still afloat as a stationary transfer vessel at a riverside cement silo in Saginaw, Michigan. Propulsion systems for ships fall into three categories: human propulsion, sailing, and mechanical propulsion. Human propulsion includes rowing, which was used even on large galleys. Propulsion by sail generally consists of a sail hoisted on an erect mast, supported by stays and spars and controlled by ropes. Sail systems were the dominant form of propulsion until the nineteenth century. They are now generally used for recreation and competition, although experimental sail systems, such as the turbosails, rotorsails, and wingsails have been used on larger modern vessels for fuel savings. Mechanical propulsion systems generally consist of a motor or engine turning a propeller, or less frequently, an impeller. Steam engines were first used for this purpose, but have mostly been replaced by two-stroke or four-stroke diesel engines, outboard motors, and gas turbine engines on faster ships. Nuclear reactors producing steam are used to propel warships and icebreakers, and there have been attempts to utilize them to power commercial vessels (see the NS Savannah). There are many variations of propeller systems, including twin, contra-rotating, controllable-pitch, and nozzle-style propellers. Smaller vessels tend to have a single propeller. Large vessels use multiple propellers, supplemented with bow- and stern-thrusters. Power is transmitted from the engine to the propeller by way of a propeller shaft, which may or may not be connected to a gearbox. Some modern vessels use electric motors connected directly to the propeller shaft, usually powered by generators. These electric systems are often more energy efficient than other systems where the engine is mechanically connected to the propeller. On boats with simple propulsion systems, such as paddles, steering systems may not be necessary. In more advanced designs, such as boats propelled by engines or sails, a steering system becomes necessary. The most common is a rudder, a submerged plane located at the rear of the hull. Rudders are rotated to generate a lateral force which turns the boat. Rudders can be rotated by a tiller, manual wheels, or electro-hydraulic systems. Autopilot systems combine mechanical rudders with navigation systems. Ducted propellers are sometimes used for steering. As environmental laws are strictening, ship designers need to create their design in such a way that the ship -when it nears its end-of-term- can be disassmbled or disposed easily and that waste is reduced to a minimum. Ship construction takes place in a shipyard, and can last from a few months for a unit produced in series, to several years to reconstruct a wooden boat like the frigate Hermione, to more than 10 years for an aircraft carrier. Hull materials and vessel size play a large part in determining the method of construction. The hull of a mass-produced fiberglass sailboat is constructed from a mold, while the steel hull of a cargo ship is made from large sections welded together as they are built. Once completed, the vessel is delivered to the customer. Ship launching is often a ceremony of some significance, and is usually when the vessel is formally named. A typical small rowboat can cost under US$100, $1,000 for a small speedboat, tens of thousands of dollars for a cruising sailboat, and about $2,000,000 for a Vendée Globe class sailboat. A 25 meters (82 ft) trawler may cost $2.5 million, and a 1,000-person-capacity high-speed passenger ferry can cost in the neighborhood of $50 million. A ship's cost partly depends on its complexity: a small, general cargo ship will cost $20 million, a Panamax-sized bulk carrier around $35 million, a supertanker around $105 million and a large LNG carrier nearly $200 million. The most expensive ships generally are so because of the cost of embedded electronics: a Seawolf class submarine costs around $2 billion, and an aircraft carrier goes for about $3.5 billion. Many ships do not make it to the scrapyard, and are lost in fires, collisions, grounding, or sinking at sea. There are more than 3 million shipwrecks on the ocean floor, the United Nations estimates. The Allies lost some 5,150 ships during World War II. The Exxon Valdez spilled 10,800,000 US gallons (Template:Convert/impgal L) of oil into Alaska's Prince William Sound. By the sheer amount of oil carried, modern oil tankers must be considered something of a threat to the environment. An oil tanker can carry 2 million barrels (318,000 m3) of crude oil, or 84,000,000 US gallons (Template:Convert/impgal L). This is more than six times the amount spilled in the widely known Exxon Valdez incident. In this spill, the ship ran aground and dumped 10,800,000 US gallons (Template:Convert/impgal L) of oil into the ocean in March 1989. Despite efforts of scientists, managers, and volunteers, over 400,000 seabirds, about 1,000 sea otters, and immense numbers of fish were killed. One of the problems with ballast water transfer is the transport of harmful organisms. Meinesz believes that one of the worst cases of a single invasive species causing harm to an ecosystem can be attributed to a seemingly harmless jellyfish. Mnemiopsis leidyi, a species of comb jellyfish that inhabits estuaries from the United States to the Valdés peninsula in Argentina along the Atlantic coast, has caused notable damage in the Black Sea. It was first introduced in 1982, and thought to have been transported to the Black Sea in a ship’s ballast water. The population of the jellyfish shot up exponentially and, by 1988, it was wreaking havoc upon the local fishing industry. "The anchovy catch fell from 204,000 tonnes (Template:Convert/ST LT) in 1984 to 200 tonnes (Template:Convert/ST LT) in 1993; sprat from 24,600 tonnes (Template:Convert/ST LT) in 1984 to 12,000 tonnes (Template:Convert/ST LT) in 1993; horse mackerel from 4,000 tonnes (Template:Convert/ST LT) in 1984 to zero in 1993." Now that the jellyfish have exhausted the zooplankton, including fish larvae, their numbers have fallen dramatically, yet they continue to maintain a stranglehold on the ecosystem. Recently the jellyfish have been discovered in the Caspian Sea. Invasive species can take over once occupied areas, facilitate the spread of new diseases, introduce new genetic material, alter landscapes and jeopardize the ability of native species to obtain food. "On land and in the sea, invasive species are responsible for about 137 billion dollars in lost revenue and management costs in the U.S. each year." In addition to steel and other useful materials, however, ships (particularly older vessels) can contain many substances that are banned or considered dangerous in developed countries. Asbestos and polychlorinated biphenyls (PCBs) are typical examples. Asbestos was used heavily in ship construction until it was finally banned in most of the developed world in the mid 1980s. Currently, the costs associated with removing asbestos, along with the potentially expensive insurance and health risks, have meant that ship-breaking in most developed countries is no longer economically viable. Removing the metal for scrap can potentially cost more than the scrap value of the metal itself. In the developing world, however, shipyards can operate without the risk of personal injury lawsuits or workers' health claims, meaning many of these shipyards may operate with high health risks. Protective equipment is sometimes absent or inadequate. Dangerous vapors and fumes from burning materials can be inhaled, and dusty asbestos-laden areas around such breakdown locations are commonplace. ↑ Chief of Naval Operations (March 2001). "The Saga of the Submarine: Early Years to the Beginning of Nuclear Power". United States Navy. http://www.navy.mil/navydata/cno/n87/history/subsaga5.html. Retrieved 2008-10-03. ↑ "Aksum by MSN Encarta". Aksum by MSN Encarta. Encarta.msn.com. http://encarta.msn.com/encyclopedia_761564182/aksum.html. Retrieved 2009-04-21. ↑ Cultures and Customs of Somalia. Books.google.com. http://books.google.com/books?id=2Nu918tYMB8C&pg=PA13&lpg=PA13&dq=medieval+Somali+sailors&source=bl&ots=P3s1IVhLJ2&sig=5IDkjvLob321LIDJ_rZziUDr4Eo&hl=en&ei=VAGNSaz-Dce_tgenhPSHCw&sa=X&oi=book_result&resnum=1&ct=result#PPA13,M1. Retrieved 2009-04-21. ↑ Historical Archaeology. Books.google.com. http://books.google.com/books?id=cmaTt05CJ3wC&pg=PA242&lpg=PA242&dq=Great+Zimbabwe,+trade+port&source=web&ots=ELQWITSQBh&sig=csunYmjV_QorK-z4AMNK-0LXZTA&hl=en&ei=QfmMSeqjAYG4tweu9uiGCw&sa=X&oi=book_result&resnum=4&ct=result. Retrieved 2009-04-21. ↑ Joan Baxter (13 December 2000). ""Africa's 'greatest explorer'"". BBC News. http://news.bbc.co.uk/2/hi/africa/1068950.stm. Retrieved 2008-02-12. ↑ "Eastern and Southern Africa 500-1000 AD". Metmuseum.org. http://www.metmuseum.org/toah/ht/06/sfe/ht06sfe.htm. Retrieved 2009-04-21. ↑ "Tanzanian dig unearths ancient secret by Tira Shubart". BBC News. 2002-04-17. http://news.bbc.co.uk/2/hi/africa/1924318.stm. Retrieved 2009-04-21. ↑ A History of Mozambique. Books.google.com. http://books.google.com/books?id=vLzp_zs1t6cC&pg=PA245&lpg=PA245&dq=Swahili+trade+ports&source=web&ots=xaFMc5_8QA&sig=BE9b98sOE1jAjl927RiwTXVCHTw&hl=en&ei=efaMSdiXNdWDtweDr6mqCw&sa=X&oi=book_result&resnum=6&ct=result. Retrieved 2009-04-21. ↑ "Ibn Battuta: Travels in Asia and Africa 1325-1354". Fordham.edu. 2001-02-21. http://www.fordham.edu/halsall/source/1354-ibnbattuta.html. Retrieved 2009-04-21. ↑ "West African Kingdoms". Kurahulanda.com. http://www.kurahulanda.com/west-african-kingdoms/west-african. Retrieved 2009-04-21. ↑ "The Story of Africa". Bbc.co.uk. http://www.bbc.co.uk/worldservice/specials/1624_story_of_africa/page82.shtml. Retrieved 2009-04-21. ↑ "Africa's 'greatest explorer' by BBC". BBC News. 2000-12-13. http://news.bbc.co.uk/2/hi/africa/1068950.stm. Retrieved 2009-04-21. ↑ 37.0 37.1 37.2 37.3 UNFAO, 2007, p. 25. ↑ Paulet, Dominique; Presles ,Dominique (1999) (in Français). Architecture navale, connaissance et pratique. Paris: Éditions de la Villette. ISBN 2-903539-46-4. ↑ With the addition of corvettes, this is the categorization used at United States Navy. "U.S. Navy Ships". United States Navy. http://www.navy.mil/navydata/our_ships.asp. Retrieved 2008-04-20. ↑ Arango, Tim (2007-09-11). "Curse of the $500 million sunken treasure". Money.cnn.tv. http://money.cnn.tv/2007/09/10/news/companies/odyssey_treasure_fortune.fortune/index.htm. Retrieved 2009-09-19. ↑ "Frequently asked questions about the Exxon Valdez Oil Spill". State of Alaska. http://www.evostc.state.ak.us/History/FAQ.htm. ↑ 53.0 53.1 53.2 53.3 53.4 Panetta, L. E. (Chair) (2003). America's living oceans: charting a course for sea change [Electronic Version, CD] Pew Oceans Commission. ↑ 54.0 54.1 54.2 54.3 "International Tanker Owners Pollution Federation Statistics". Itopf.com. 2005-06-09. http://www.itopf.com/information-services/data-and-statistics/statistics/. Retrieved 2009-04-21. ↑ European Parliament. Directive 2005/35/EC of the European Parliament and of the Council of 7 September 2005 on ship-source pollution and on the introduction of penalties for infringements. http://eur-lex.europa.eu/LexUriServ/LexUriServ.do?uri=OJ:L:2005:255:0011:01:EN:HTML. Retrieved 2008-02-22. ↑ "Shipbreaking". Greenpeace. March 16, 2006. http://www.greenpeaceweb.org/shipbreak/. Retrieved 2007-08-27. Anzovin, Steven (2000). Famous First Facts (International Edition). H. W. Wilson Company. ISBN 0824209583. Central Intelligence Agency (2007). CIA World Factbook 2008. Skyhorse Publishing. ISBN 1602390800. https://www.cia.gov/library/publications/the-world-factbook/index.html. Retrieved 2008-02-22. Chatterton, Edward Keble (1915). Sailing Ships and Their Story: The Story of Their Development from the Earliest Times to the Present Day. Philadelphia: J.B. Lippincott Company. http://books.google.com/books?id=C-cVAAAAMAAJ&printsec=titlepage. Retrieved 2008-10-02. Cotterill, Charles Clement; Little, Edward Delanoy (1868). Ships and sailors, ancient and modern. London: Seeley, Jackson and Halliday. http://books.google.com/books?id=j1wBAAAAQAAJ&printsec=frontcover. Cutler, Thomas J. (December 2003). Dutton's Nautical Navigation (15th ed.). Annapolis, MD: Naval Institute Press. ISBN 978-1557502483. Det Norske Veritas (2008). "Knock Nevis". DNV Exchange. Det Norske Veritas. https://exchange.dnv.com/exchange/main.aspx?extool=vessel&subview=summary&vesselid=16864. Encyclopædia Britannica (1911). "Navigation". in Chisholm, Hugh. Encyclopædia Britannica. 19 (11th edition ed.). http://en.wikisource.org/wiki/User:Tim_Starling/ScanSet_TIFF_demo. Encyclopædia Britannica (1911). "Ship". in Chisholm, Hugh. Encyclopædia Britannica. 24 (11th edition ed.). pp. 881–889. http://en.wikisource.org/w/index.php?title=User:Tim_Starling/ScanSet_TIFF_demo&vol=24&page=ED4A915. Lavery, Brian (2004). Ship: The Epic Story of Maritime Adventure (Smithsonian). New York: DK Publishing Inc. ISBN 0756604966. Maloney, Elbert S. (December 2003). Chapman Piloting and Seamanship (64th ed.). New York, NY: Hearst Communications Inc.. ISBN 1-58816-098-0. Office of Data and Economic Analysis (July 2006). "World Merchant Fleet 2001–2005" (PDF). United States Maritime Administration. http://www.marad.dot.gov/MARAD_statistics/2005%20STATISTICS/World%20Merchant%20Fleet%202005.pdf. Retrieved March 13, 2007. Overseas Shipholding Group (2008-02-22). "Overseas Shipholding Group Fleet List". Overseas Shipholding Group. http://www.osg.com/uploadedFiles/2222008FleetlistDownload.xls. Singh, Baljit (July 11, 1999). "The world’s biggest ship". The Times (of India). http://www.tribuneindia.com/1999/99jul11/sunday/head3.htm. Retrieved 2008-04-07. Turpin, Edward A.; McEwen, William A. (1980). Merchant Marine Officers' Handbook (4th ed.). Centreville, MD: Cornell Maritime Press. ISBN 0-87038-056-X. Stopford, Martin (1997). Maritime economics. New York: Routledge. ISBN 0-415-15309-3. http://books.google.com/books?id=_R-YB70kly8C&printsec=frontcover. This page was last edited on 26 June 2010, at 22:40.